Join the discussion on our forums! Come discuss Silithid Swarmer over in our dedicated Silithid Swarmer discussion topic. Can only attack if your hero attacked this turn. If your hero doesn't attack, it's just "Silithid Loner". P.S. Can someone explain to me, how to post images here? This page needs a reset since the card is now a beast. 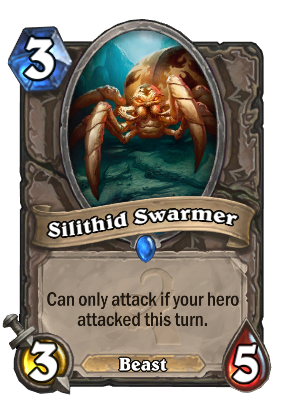 Surprisingly once it became a beast it became a little bit better, as it combos nicely with Hunters, and Rouges can use them in Arena. I have one in my Midrange hunter deck, it works pretty good, just something a little bulkier those early turns. I tried running two, but then you get stuck with it dead on the board, with one i've yet to be forced to play it without a bow or a Houndmaster at hand. Not a game-changer, but viable. I do wanna see if it could work out in beast druid. I suppose I shouldn't complain considering what I got in the pack, but this is the one that had to be golden? can someone explain why this card is viewed as not garbage? if a 3/4 for 3 with at least a a tribe is considered meta, why is a 3/3 with an objectively bad card text and no tribe considered not trash? I think this card is better than people give it credit for, it looks really good in rogue, and i'm convinced that it can work in warrior and druid quite well too. Great stats, and not the worst limitation(especially for rogue!). If it could attack the turn it was summoned, I think it would be better, and it really should have the "Beast" tribe instead of having no tribe. I would really want to use it in Pirate decks(Malkorok is great too! ), or more hero-power centric Rogue decks. I think this card is okay in rogue, not amazing but certainly fringe playable. 3/5 stat line is very good for 3 mana, and in rogue attacking isn't much of a drawback. Comparing this in my head to Ancient Watcher. Cheap, sturdy body for taunting. But where warlock also uses watcher for Shadowflame, this helps weapon classes trade or push a little face damage without needing silence. Warlock probably gets more mileage out of watcher. Can see attack ordering making things needlessly complicated. Probably trash.